There's not just a single secret to making a delicious burger, there's about five of them, and they're not really secret what with me publishing them on the internet and all. But that's fine. Let everyone in the world enjoy perfect hamburgers is my feeling. Note that I'm not going to tell you what to put on your burger. That's so much a matter of personal taste that I wouldn't presume. 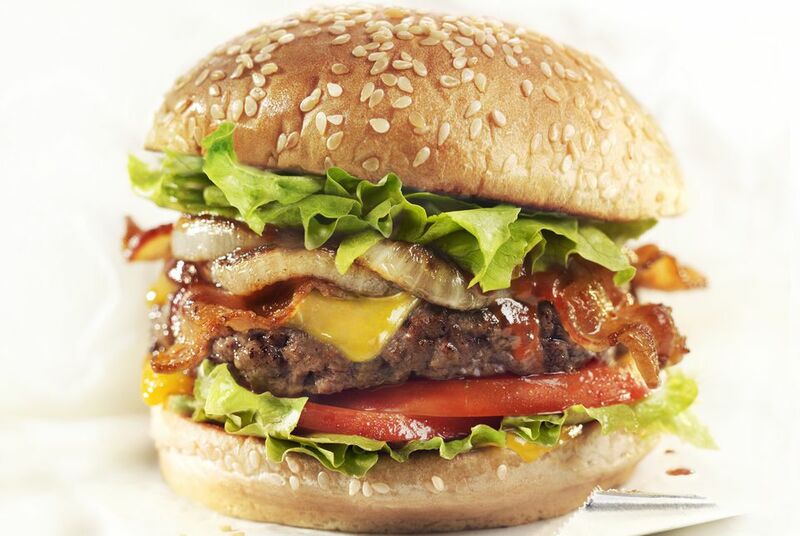 Plus, can you imagine if I said the best burger has, say, avocado, bacon, grilled onions, and American cheese on it? I guarantee I'd be getting emails from people complaining that I didn't mention pineapple or chipotle mayonnaise or tapioca balls. What I will tell you is how to cook a burger so that it comes out juicy, flavorful and succulent. The first step is buying ground beef with an 80/20 lean-to-fat ratio, that was ground freshly in the store that day. If you can get 100% ground beef chuck, so much the better. Here's more about how to buy the best ground beef for your burgers. I should mention here that I have been known to make burgers with three parts ground beef chuck and one part ground pork. If you try this, you may wonder why nobody ever told you about this before, and, well, you're welcome. The next thing you want to do is season your ground beef with Kosher salt and maybe one or two other ingredients, like freshly ground black pepper, or garlic powder, or Worcestershire sauce. But don't go overboard. And the most important seasoning is the salt. Remember, if you're making your burgers with beef chuck, they're going to have a deep, meaty flavor that you actually want to be able to taste. Keep it simple. Now here comes the big pitfall for most people. When they go to form the patties, they pack them WAY too tightly. Usually, if you watch someone making a burger patty, it's like the Incredible Hulk is crushing a tank with his bare hands. Let me assure you that these feats of strength, while awe-inspiring, will cause the cooked burgers to become hockey pucks. What you want to do instead is just very gently shape the seasoned meat into balls, and then very gently flatten those balls into patties that are about 3/4 of an inch to an inch thick. Imagine you're giving a baby a back rub and you should have the right amount of pressure. A lot of people assume that the best way to cook a burger is on the grill, but interestingly enough, the very best way is in a cast-iron skillet. When you cook a burger over a grill, the fat melts and drips uselessly onto the coals, which means your efforts to procure 80/20 ground beef will have been for naught. Then the hot coals more or less dry out the surface of the meat and you end up with a burger that, while OK, is far from amazing. A cast iron skillet, on the other hand, keeps that fat right there where it can coat the burger and give it a luscious, meaty, fatty sheen, while also helping to produce a flavorful, almost crispy exterior. But again, most of that fat will end up in the pan. Keep a can in the kitchen and pour it there, and when the can is full just toss it in the trash. Or let the fat solidify in the pan, scrape it out and transfer it to the bin. But whatever you do, don't pour the liquid fat down the drain. Tell me you don't do that. Right? Okay, so about the cast iron. It works so well, and the burgers cooked that way are so superior, that on nights when it's too hot to cook inside, I will get some charcoal going and plunk the cast iron skillet right down on the grill and cook my burgers in the skillet, on the grill. It works perfectly. This isn't really one of the secrets to making amazing burgers, but in the interests of food safety, I need to mention that it's a good idea to cook your burgers all the way through. I started out when it came to burgers as a pink-in-the-middle guy, but I really can't do that anymore, and I don't recommend you do either. But if you must, you should learn how to grind your own meat. If you're going to consume undercooked ground beef, you should at least know that it came from chunks of fresh beef chuck that you ground yourself moments earlier.